Arthur James Wetherall Burgess (1879-1957). Gouache, signed and inscribed "HMAS AUSTRALIA 1.1.19" (LR). Standard size: 8 x 5 1/2 ins (20 x 13.5 cms) approx though available at other sizes to order. Listed in January 1919’s Navy List under the heading “HM Australian Ships Serving with the Royal Navy” AUSTRALIA was laid down at John Brown & Co’s yard on the River Clyde in Scotland in June 1910. She was completed in June 1913 and as with her sister, NEW ZEALAND, she was paid for by the Dominion government. INDEFATIGABLE, the third of the class, was to be lost at Jutland in May 1916. After initial trials and testing the 590 ft long AUSTRALIA  essentially a coal burner but with some 800 tons of furnace fuel oil carried as a supplement to increase the burn rate - was commissioned into the RAN at Portsmouth on 21 June 1913 and shortly afterwards Rear Admiral George Patey, the first Rear Admiral Commanding Australian Fleet, hoisted his flag in her. She was armed with eight 12 inch guns and sixteen 4 inch guns and at full power her four propellors drove her at some 25 knots. On her ceremonial arrival in Sydney on 4th October 1913 she became the largest warship “resident” in the southern hemisphere. Only 9 months later, with war in Europe appearing imminent, the RAN came under Admiralty control in London and AUSTRALIA was placed in command of Australasian operations against Admiral von Spee’s German East Asia Squadron. 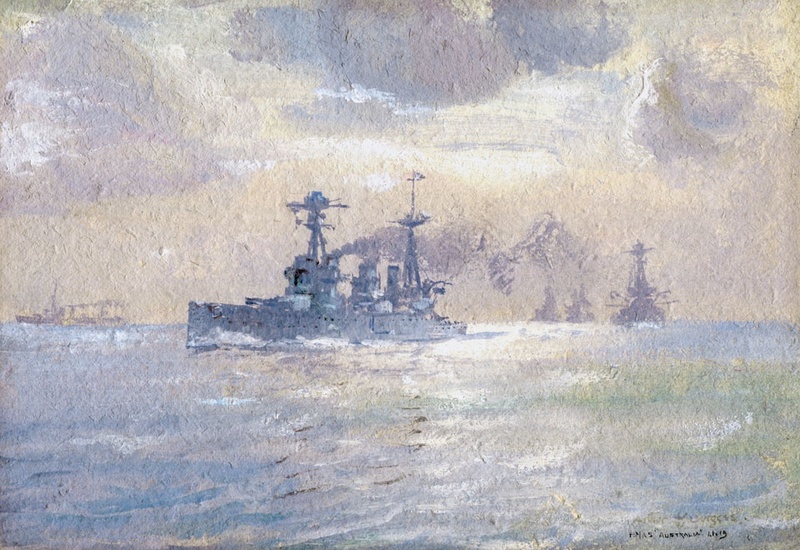 After a very busy 3 months during which AUSTRALIA steamed many thousands of miles and conducted numerous operations of value throughout the Pacific/Australasian theatre she found herself back in Scotland with the British Grand Fleet in Scapa Flow where her presence was needed by a Commander-in-Chief who was charged with maintaining dominance over the German High Seas Fleet in the North Sea. In February 1915 she became flagship of the 2nd Battle Cruiser Squadron and but for a heavy collision with her sister NEW ZEALAND in April 1916 which kept her in dry dock in Devonport until June, she would have been present at the Battle of Jutland on the last day on May. And so AUSTRALIA survived a busy war and on 23 April 1919, having taken part in the surrender and subsequent internment of the German Fleet  a surrender for which she herself had worked so hard - she left UK waters for the last time to return to Sydney. This painting, dated by the artist 1st January 1919, shows her therefore in the last few weeks of her time with the Royal Navy’s Grand Fleet. She is wearing the flag of Rear Admiral Sir Lionel Halsey KCMG CB and is commanded by Captain Claude Cumberlege CB RN. But the Great War had all but bankrupted the British Empire and the battle cruisers needed massive refits to bring them up to contemporary technical standards and eleven months later HMAS AUSTRALIA was placed in Reserve in Garden Island, Sydney. Manning the ship was also proving difficult and spares were in short supply with many equipments now being obsolescent. The Washington disarmament Treaty of 1922 was the final nail in AUSTRALIA’s coffin and she was disposed of by scuttling some 25 miles north east of Sydney Heads. Hers had been a short but famously busy career.